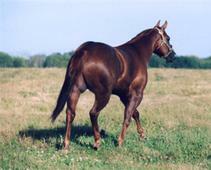 Sire is Misters Gold Fever AQHA Superior Halter in 1997 ~ PHBA World Champion in 1996. Trilogy has also won first in halter under Ken Shaw at East Central Futurity. Won Reserve Grand Champion at Braham Futurity with over 60 head. Trilogy is extremely athletic. If you want a horse to halter and ride this is the Stallion you want. This stallion has his Superior in Halter and has produced some of the current leading halter and riding horses in the nation! Quality, Athleticism, Conformation... AND COLOR! 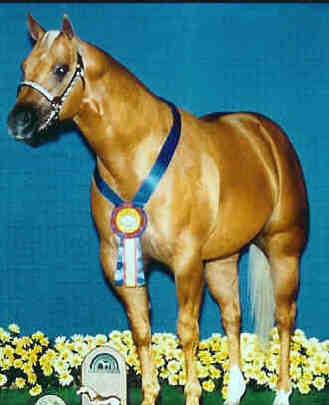 Misters Gold Fever received his ROM in halter in 1995. 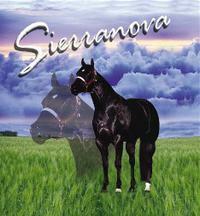 This fine stallion was PHBA World Champion in 1996 and received a Superior in Halter by the AQHA in 1997. His sire is the great Mr. Conclusion and his dam is Brittnie who has 43 halter points and placed Grand 7 times. 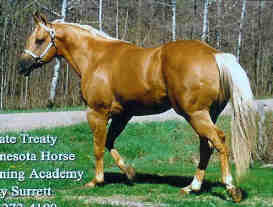 Brittnie was sired by Color Me Skip who is a Superior halter and pleasure stallion and AQHA Champion as a sire. Misters Gold Fever followed in his sire and grandsires' hoofsteps with numerous futurity, congress and world champions that halter and perform in western pleasure. His foals have the Conformation, color and athleticism that judges love. Gold Fever will never be replaced nor forgotten. His offspring are doing well in halter and riding classes. MN Horse Training Academy offers offspring from Misters Gold Fever for sale along with broodmares and well-trained trail horses. Please check us out!